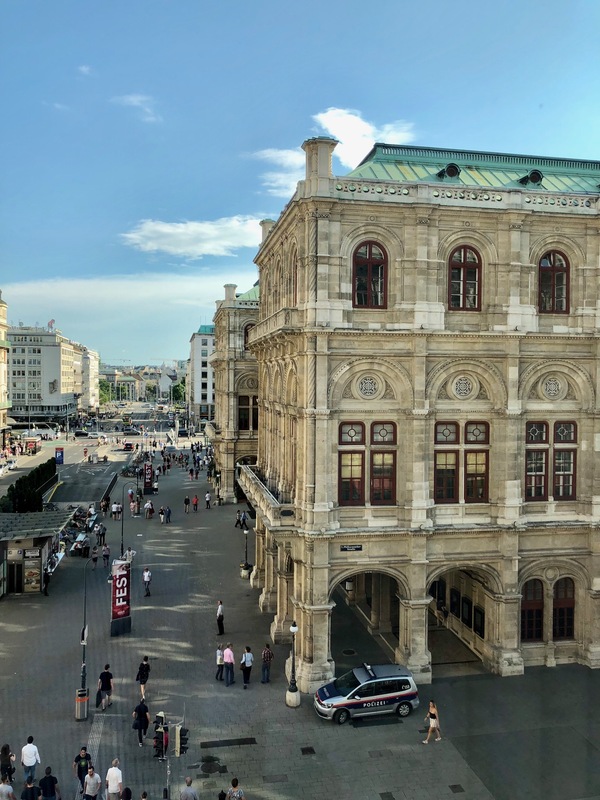 Last Spring, the Spoiled Guest toured several favorite spots in Europe — Paris, Lake Garda in Italy, Vienna, Saltzburg, and Munich. 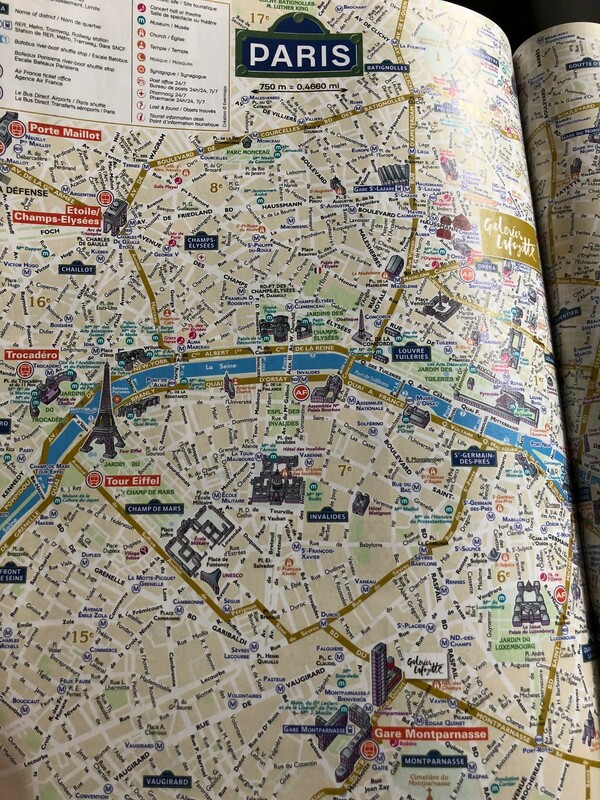 There follows an unvarnished, essentially verbatim diary of the trip, with an emphasis on hotels and restaurants that we hope fellow travelers will find useful and entertaining! Arrive Paris around 6:30 am on the American flight from Charlotte under partly cloudy skies. Lovely Japanese lady greets us at the door of the plane and whisks us thru security to our waiting Mercedes. Hour+ ride to The Hotel Ritz. We have a tour of the premises. Spectacular suite (upgrade compliments of our travel agent). Breakfast in the Vendome, then a long walk, then lunch at the hotel (club sandwiches just ok, one would serve two) then a nap (including “nap”). A pilot friend from the States texts to say he’s in town on a layover, so we meet him for drinks in the bar before heading to Tour d’Argent (see review below) in the hotel’s Bentley. Beautiful but hot room in the early evening sun (8:15 pm), but blinds are raised later on a lovely view of the rooftops and the Seine. Amazing amuses, we both have the white asparagus, I have wonderful duck breast, C has equally delightful filet of sole. Great crepes for dessert, perhaps not better than at La Langouste in St. Barts. Home in a nice taxi. Drinks in the bar, to bed. Up at 9, breakfast in the Vendome, not enough time for the D’Orsay before our 2 pm massage, so we walk to Deyrolle on the left bank to take in the amazing taxidermy. Cute shops; C buys blouses. Back to The Ritz for lunch, then hastily to the spa for our massages. Mine serviceable. C gets makeup done, pays for all. In our room, cloudburst outside; we open the windows to the rain and thunder — beautiful! Taxi ride to dinner at Le Fontaine du Mars bistro, full of Americans, but excellent bistro fare — wonderful terrine of foie gras, succulent beef cheeks stuffed with mushrooms, and a breast of chicken with morel sauce. Janasse to drink and floating island for desert. Amazing! Home to the bar for nightcap — to bed. Up a little earlier, shopping for shoes at sports place after breakfast. That done, we head across to the d’Orsay and a wonderful Impressionists exhibit and the amazing hall. Then to lunch at Le Recamier on the Left Bank in the 7th: the most wonderful steak tartare I’ve ever had, and a mushroom soufflé equally astounding, along with rose’ and Poiully Fume’ by the glass. Absolutely wonderful, we want to go back! To the hotel for a nap. Later, quick ride in the Bentley to Pavillon Ledoyen. Awkward/no reception, lovely room at dusk, spotty service (they take two tries to get C’s drink right), remarkable food, but less enjoyable than Tour d’Argent, with which it competes in the old-school (but modernized) haute cuisine dept. C has turbot in a light wine sauce, I have poultry in a morel sauce, just ok. For dessert, C has rhubarb baked in a crust of Rice Krispies (or so it appears) and rice ice cream, wonderful, and I have an amazing crispy ravioli of butternut squash w vanilla glacé. Calvados after, a nice Uber ride back to the hotel, and nightcap in the Bar with the wonderful young hostess, Katarina. To bed. Up at 9, overlong breakfast w B-team service, then longer-than-I-expected walk to Ile de la Cite’ and Notre Dame, both thronging with tourists. The small park by ND much more run-down than I remembered. Then up through the Marais, delightful mews of shops, to Clover Grill for lunch. Charcuterie style, and crowded, but we have excellent flounder with amazing pomme frites AND 50/50 butter/mashed potatoes, after a lovely asparagus soup in beautiful ceramic bowls. Chassagne Montrachet by the glass and an amazing grilled pineapple with tea ice cream. At the next table, a weird American guy and his silent female companion are having a marathon meal of steak, truffles, etc. Back to the hotel and a much-needed nap. Then to dinner at Au Bon Georges, a charming little retro bistro in the Pigasse. Charming young waiter, lots of locals, cafe seating, I have excellent carpaccio, C has a wonderful ground beef sans bun. Terrific ambiance on a lovely Paris night. Home to Katarina, our new best friend, in the Bar, and to bed. After breakfast, fun walk along St. Honore’ to the Musee Jacquemart-Andre’ for a look at the Mary Cassatt exhibit, which is fun but very crowded. Wonderful old home named after the couple who built and populated it with art, reminiscent of the Frick in NYC. Lunch at a random Japanese-French fusion place on the way home (Zo? ), quite good pasta. Napping, packing, then we cancel Arnaud Nicolas as it sounds too much like another charcuterie, and we go back, in the rain, to Le Recamier via nice Uber driver with an umbrella. Another stunningly good steak tartare and a superb Roquefort soufflé. Gran Mariner soufflé for desert, home to Katarina and her colleagues. Up reasonably, lovely final breakfast, then to the awful CDG, crowded and unpleasant, old French bag ladies butting in line (though the bags are Chanel). Flight to Milan somewhat delayed, but bags fit in the overhead (an A318), and Air France manages once again to put out a delectable little lunch of cold salmon, rice, and desert. Nice young guy meets us at the airport and we’re off from Malpensa, 2 hr drive to Villa Feltrinelli. Beautiful as ever, Gabi is there to greet us with hugs. Up to our astounding and now-familiar Al Lago suite. Unpack, down for a drink and beautiful canapés by the lake, then up to change for dinner. On the veranda this time, beautiful night, Peter joins us for a drink. I have the pigeon and of course the crespelle. Magnificent. Fernet Branca after and to bed. Cloudy, cool breakfast. Walk to the pharmacia for ibuprofen and shampoo. Back to hotel for walk around the grounds, and Gabi shows us the lovely new room, “Contadino” with a massive bath, lovely patio and lawn —next time! Sit by the lake under the olive trees, then a beautiful lunch of green salad and veal ravioli for me, delicious eggplant Parmesan for C. C goes to massage while I return to the chairs to observe the paddle boarders on the lake and write. Upstairs to nap, then down for a drink and a quick ride to Restaurant Lido; daylight much later at this time of year, and cool in the evenings. The place isn’t as pretty in the daylight, but the proprietor is suave and remembers us and regales us with stories of his youth on a visit to California. 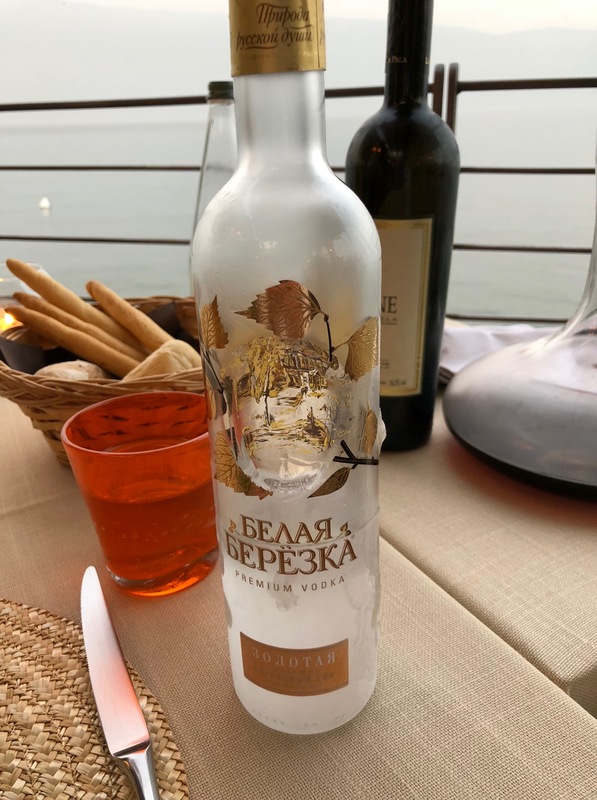 I have a nice carpaccio, C has fish tartare, both good, she has steak and I have local fish — just ok. Lots of Russian vodka and a nice Amarone. Nice panna cotta for desert. Back to VF for more Russian vodka, C’s new fav, if only we could read the label or pronounce it. To bed. Wonderful omelet for breakfast, then a long walk up the hill, all remembered. Road above the villas closed to even pedestrians this time. Back for lunch (a fine risotto), and reading by the lake. Some debate about the best way to fly to Vienna, but turns out our travel agent had it right and only Venice has non-stops. A nap, some packing, and down to drinks (Snow Leopard! Russian Standard!) dinner with Peter and eventually Gabi in the lovely little bar. To bed. Lovely morning, up early for us as it’s departure day and we have a long drive to Venice airport — and it’s an Italian holiday (“Repubblica” — their version, I take it, of the Fourth of July). Breakfast, then tearful goodbyes and hugs, and we’re off in the speedy Mercedes through the clogged streets of Garda-land. Half of Lombardy seems to want to go to the lake today — like Tahoe after a good snow. Relatively quick trip to Marco Polo International (2 hrs 15 minutes) despite the traffic around the lake. Simple security for “priority” people. We hang out in an ok lounge and have a snack, then descend into the purgatory of the regional flight gates, where we stand interminably in line before being loaded on a hot bus to the plane. Once aboard, the flight is delightful, great lunch of curried chicken. 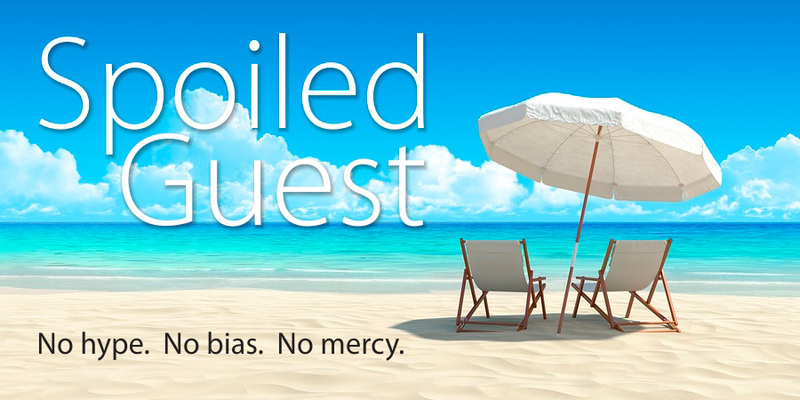 But note to self: avoid Marco Polo International. We are met in Vienna’s airport, after some searching, by an ancient driver who takes us to the Hotel Sacher. Desk staff, led by a young guy with a blank, almost hostile demeanor, is the first of many palpable downfalls. Nonetheless we’re upgraded and led to a wonderful chandeliered suite with a giant living room, a huge marble bath, and beautiful original period art. After a nap we wander the Kartnerstrasse pedestrian mall, then go a day early to Plachutta Restaurant (see below), because we can’t get into either of the Hotel’s restaurants till 10 pm. Truly mediocre meal (C has schnitzel), lousy service. Home to drinks in the tiny, beautiful Blue Bar, to bed in our weird futon “sheets”. Breakfast with the masses at the buffet downstairs, though a pretty room, then back to the street to the Stefansdom cathedral, ancient and magnificent. We decide to wait till Monday to go in. Instead we spend most of the day in the Natural History Museum, which C loved and had more attention span than me. Lunch on the plaza behind the Youth Museum, then back for more natural history. Amazing exhibit about the Rosetta comet probe, which I had forgotten about. 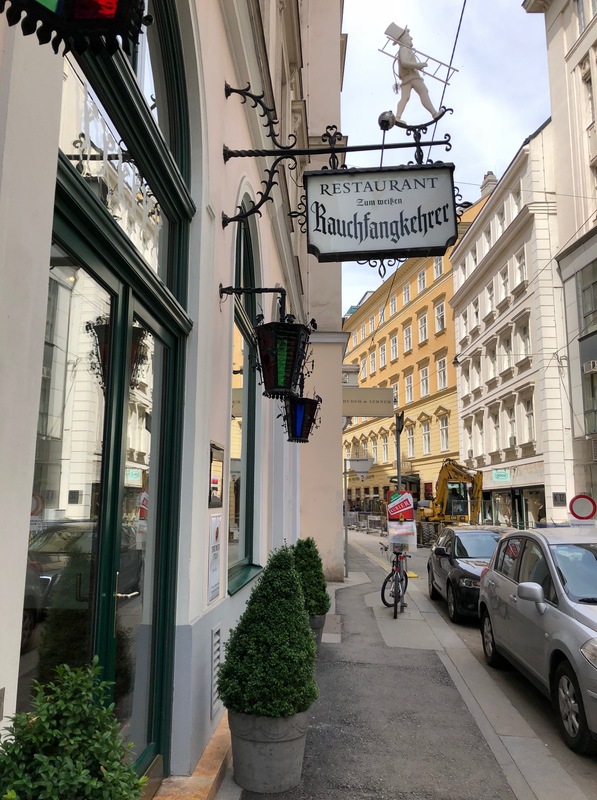 Home to nap, drinks in the Bar — sharp, nice waitstaff — then to the wonderfully named Weissen Rauchfangkehrer, or white chimney sweep, who apparently slept with the baker. This is the intro to Austrian food and atmosphere we should have had the night before. Charming service, delicious schnitzel and pork, delightful piano player and authentic, un-kitschy ambiance. To Bar and to bed. We awake to some pounding sounds of construction — at 7:30 am. Breakfast in our vast living room – delightful – then (after yet another stop for shoes, this time at Geox) to Stephansdom, which we tour with audio guides — staggeringly beautiful. Then to the Empress “Sisi” Museum, endless serving-ware and rooms full of 19th century art and artifacts, interwoven with biography of what was obviously a very strange, depressed, if beautiful woman. Fun but long. Back to Lobmeyr where we’d stopped earlier to pick out a pair of beautiful wine glasses for Gabi and Peter and some linens for home. Nap, “nap,” dress up for dinner, down for a drink and a fun taxi ride with a delightful friendly driver to Steirereck in the park, world renowned gourmet restaurant. Beautifully modern ambiance and absolutely delicious food, from the astonishing canapés to the four course meal (could have left a course out as the portions were larger than the usual effete hyper-gourmet offerings), each course written up on little cards (which, see). A half- bottle of Tignanello. Food far better in my view than Pavillon Ledoyen and even Tour d’Argent in Paris (though C prefers the latter), and less expensive than either. Summoned a taxi and straight to bed. More pounding in the early morning, closer this time. Thankfully our last, despite the beauty of the rooms. Astonishingly inept staff for breakfast in the beautiful “traditional” restaurant — young Hindu waitress apologizes to C for her absence by proclaiming that she was “on the toilet”(!). Staff needs training. Later on checkout I have to argue with an arrogant young bellhop over whether we have ordered at car to take us to the train station. He tells me twice that there is no car reserved before I appeal to the concierge and he’s reluctantly overruled. No apology. Did I mention that the staff needs training? To the western train station (immaculate) with a friendly, voluble driver who tells us everything about everything, including the train we’re about to get on, since he used to be the station master. On the beautiful, immaculate, fast train to Salzburg. Met at station by a younger Arnold Schwarzenegger, quick trip to hotel Sacher Salzburg. Much more friendly and professional staff than at Sacher Wien, though a smaller room upgrade (how could it not be?). Simon the concierge directs us to lunch atop the mountain in the cafe of the modern art museum. You pay to ride the elevator up, and again to get out at the bottom. One-way ticket on the elevator, please! No idea what would happen if you ran out of money in between. Nice lunch overlooking Salzburg, then wandering the streets. We find the fancy shopping street, choked with Chinoise. Dirndl skirts! Fun. A couple of beautiful churches, then back to a nap. Dinner at a nice, if empty, Italian place in old town. Home to drinks in the very nice, professionally staffed, and more spacious than the Blue Bar bar, and to bed in the same strange duvet comforters as in Sacher Wien. Nice buffet breakfast amongst mostly American tourists, some the same as in Vienna. Then to the amazingly beautiful Mirabell Palace gardens, thick with roses. Sit and stroll, sit and stroll. Magnificent gates and urns. Charming streets on the “new” side of town. Back across the Danube for dirndl shopping — and I get a beautiful suede Father’s Day jacket from my lovely wife! Excellent lunch in a cafe by the river —amazing gazpacho and schinkenfetel (?? Baked pasta, cheese and ham!). To a pharmacy for ibupofren, then home as it begins to rain to pack and nap. Drinks in the bar with our buddy bartender from Holland, then off in a gentle sprinkle to Flavour, a charming if a bit overly laid-back local place, tasty salads and great, simple steaks with white asparagus and hollandaise. Service sort of gives out after the entrees — no offer of desert or coffee — we outlasted the kitchen, perhaps, though it’s still early. Back to the bar — no rain now — for still more drinks, and to bed. I have perhaps the strangest dream of my life, Spanish CVS checkout girl leads me to secret employee lounge which transforms into a rooftop wonderland, only to come under sniper fire just as I’m kissing her. Turns out it’s just Germans. Wow. Finish packing, buffet breakfast, discover thru correspondence with my bank that perhaps my ATM card wasn’t hacked, but I inadvertently used it in Ledoyen to pay for one of our sumptuous meals (different name of payee in the charge records, but the amount is about right). Checkout smooth, in speedy BMW sedan to Munich over beautiful wooded back roads and through charming Alpine-y villages. “Precious,” as C keeps saying. Into Munich in under 2 hrs. Helpful desk staff at the Mandarin Munich, beautiful, vast upgrade room in the turret of the building, dormer windows, etc. Nice lunch at Zum Somethingorother, walk around Marienplaz, to Alte Peter, amazing space and altar (no pics allowed). To the Dom (Cathedral Church of Our Lady), very austere, to the wonderful Dahlmeyer food emporium, along the Maximilianstrasse, home to a nap, then to Nobu’s place in the hotel, raucous and inauspicious at first, but charming gay girl manager Elina, and amazing food (sushi, chicken robata with miso dip, miso black cod). Much chat with Elina and plans for lunch Saturday with her and her partner Luzie, who works at the front desk and is beautiful — we’ll see. To bed! After breakfast in Nobu (Matsuhisa, actually), we’re off to the Marienplatz for the 11 am running of the glockenspiel. Then in search of gifts in a tacky tchotchkes store (much falderal shipping home). 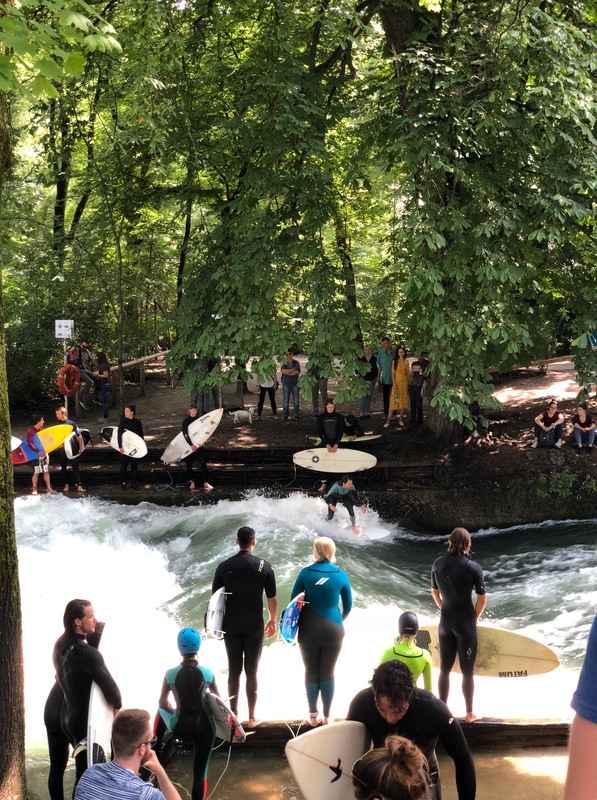 Then off to the English Garden, where we happen upon the surfing spot on the Eisbach — amazing! Leisurely walk back through the Garden to Brenner Cafe, next to Brioni, wonderful Italian lunch of tuna tartare and beef carpaccio. Then in search for linen in the deeper more interesting part of the Viktualeinmarkt (food market), at a huge, fascinating housewares department store called Kustermann that Luzie (Elina’s partner) had put us on to. Linens duly found, we look for a jewelry store that Elina likes, but it’s a bust and they’ve never heard of her. An amazing Eataly, like a giant Dean & DeLuca and a branch of the Eataly in NYC, seems somehow out of place here. Then a wedding march goes by in full Bavarian regalia, and Holy Ghost Church is open today, magnificent. Bushed, back to the hotel. We nap, then dress up somewhat and a taxi ride to the Konigshof Gourmet Restaurant. Nice bar, and on the restaurant level quite impressive, but we’re ushered away from the big view room to the intimate, non-view romantic room, where three other tables are being served. Sepulchral is the only word for the ambiance; we could be in the greeting room of a mortuary. Diners speak in hushed tones over their ox cheeks and venison, nary a utensil clinks unnecessarily, sommelier and captain are friendly but stiff. The food, which is the point, is good, in that self-consciously gourmet-forgettable way. Three hours later, exhausted by the serenity, we Uber home and directly to bed. Last day of a wonderful trip. Leisurely breakfast, then we walk to Eleni and Luzie’s charming neighborhood, where we meet them at the Aloha Poke, a sweet hole in the wall that serves healthy poke bowls. I enjoy a tuna and salmon tartare, C has a great Caesar. We wander around the neighborhood, stop for excellent ice cream, and end up back in the center city, where C buys some gifts of jewelry. Eleni and I have a talk about Trump (she’s incredulous, but who isn’t?). The girls follow us all the way back to the hotel, where C has a massage they’ve arranged and I start to pack. Learn that United has changed planes and that we’re no longer in first, but in “Polaris” class, in a 2-class 747, which sounds suspiciously like business class to me. After two long calls with United agents, one of whom leaves me on hold forever, I’m somewhat assuaged that the seating is comparable, that United would charge the same number of miles for either, and we’d have to wait a day to get back to the original configuration. Weird and annoying. Also can’t print my boarding pass. Dinner at Pfistermuhle, covered with ivy, nice and unassuming, and close to the hotel. I have breast of Bavarian chicken. To the hotel for a quick drink with Eleni, a hug from Luzie, and to bed. Nice breakfast in the room, off to MUC in a beautiful Mercedes with a faultlessly polite Asian driver. Quick 20 minute trip, and our driver escorts us to the United desks, where I realize I don’t have my briefcase, so our guy hoofs it back to the car for me. Luckily I’ve tipped him well. Through security with no problem, to the rigidly caste-conscious Lufthansa Business Class lounge, then to our gate, but not before a second round of security for which I’ve been “randomly” selected. An additional 10 minutes, both bags opened and checked for explosive residue, shoes off, belt off, pat down, the whole works. Finally we board and the Polaris pods (Pods’ little acre?) are lovely and more high-tech and spacious than the American first class seats we flew over on. But there are at least 6 other passengers like us who thought they’d be in first, and a lot of them seem to be complaining. Also the flight attendants seem to have been blindsided too, as they’ve been shorted meals and have to ask for first and second entree choices. First world problems, as they say. Wonderful trip we both agree. Dining in Paris: Tour d’Argent was great fun and good food, though oddly not our best meal in Paris by a long shot. Pavillon Ledoyen was something of a disappointment; lovely atmosphere but spotty service, food more pretentious but not as good as at Tour d’Argent. Would skip it next time. Le Fontaine du Mars is completely full of Americans, but excellent bistro fare — wonderful terrine of foie gras, succulent beef cheeks stuffed with mushrooms, and a breast of chicken with morel sauce. Janasse to drink and floating island for desert. Amazing! Le Recamier was the surprise of our time in Paris: the most wonderful steak tartare I’ve ever had, and a mushroom soufflé equally astounding, along with rose’ and Poiully Fume’ by the glass. Nothing fancy in terms of décor, but charming outdoor seating and obviously favored by locals. Au Bon Georges is a charming little retro bistro in the Pigasse. Good waitstaff, lots of locals, cafe seating. Terrific ambiance on a lovely Paris night. Villa Feltrinelli – I can’t say anything about this place that I haven’t already said in these pages, other than to confirm that it is still my single favorite hotel in the world and part of its beauty is that it is so reliably consistent from year to year – in professionalism, beauty, staff, and the hard-working yet lighthearted management by Gabi Schoder and Peter Eisendle, who have become friends. This was our fifth visit to VF, and each time only inspires a desire to return. It’s that good. 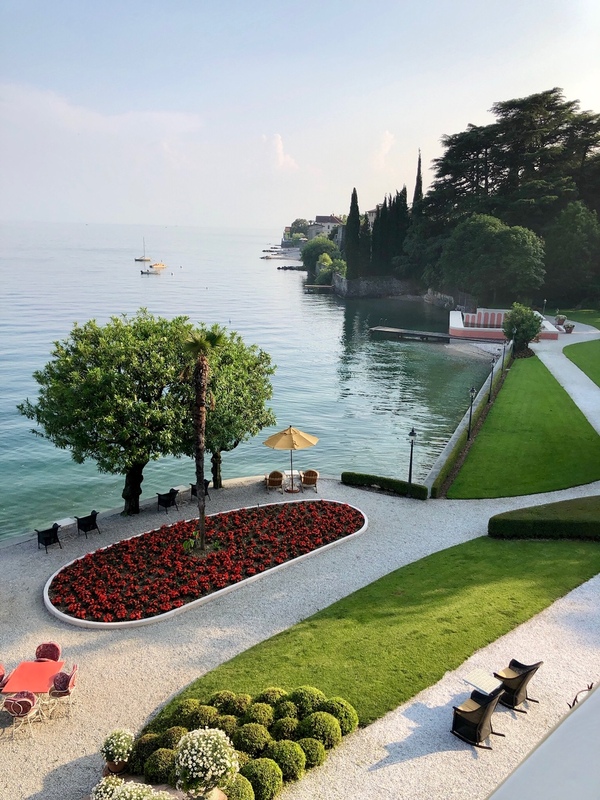 Gabi had snared us the Al Lago suite when a cancellation arose, and we were thrilled as always to be in it, but next time we’re going to try the Contadino suite in one of the out-buildings, just for a change (and to save a few thousand Euros). Sacher Wein – this a lovely old warhorse of a hotel that is in dire need of better staff training. Desk staff, led by a young guy with a blank, almost hostile demeanor, was the first of many minor but noticeable downfalls, which culminated one morning when my wife was informed by a waitress at breakfast that she was sorry she’d been ignoring us, but she’d been “on the toilette.” Surely cultural differences alone can’t account for this sort of thing. Nonetheless we enjoyed our upgrade to a wonderful chandeliered suite with a giant living room and a huge marble bath, beautiful original period art, and this makes up for a lot. The tiny, jewel-like Blue Bar is delightful and its wait-staff, at least, know what they’re doing. I wouldn’t return here but on balance it’s an acceptable hotel. But be warned: there’s renovation going on, and each morning we were awakened by construction pounding nearby. Dining in Vienna: We had two memorable meals here, one in the charmingly traditional Zum Weissen Rauchfangkeher (I know, a mouthful, but worth it, and with the charming backstory of the chimney sweep (the “rauchfangkeher” sleeping with the baker (which turned him white, naturally)), serving delicious traditional Austrian fare accompanied by an excellent lounge pianist, and I was totally smitten by Steirereck, a beautifully modern place in the park with a relaxed ambiance, professional but welcoming service, and astonishingly inventive yet enjoyable food. But avoid, avoid, avoid the unaccountably popular Plachutta, to which we were directed by the concierge on our first night; very ordinary food served by an indifferent, careless staff in a place with the feel of any number of bland chain restaurants anywhere in the US. Sacher Salzburg – It was interesting to compare the two Sachers, and I must say that the Salzburg branch comes out ‘way ahead (though our suite here was small and the least impressive of all our accommodations, but fine for our short stay). 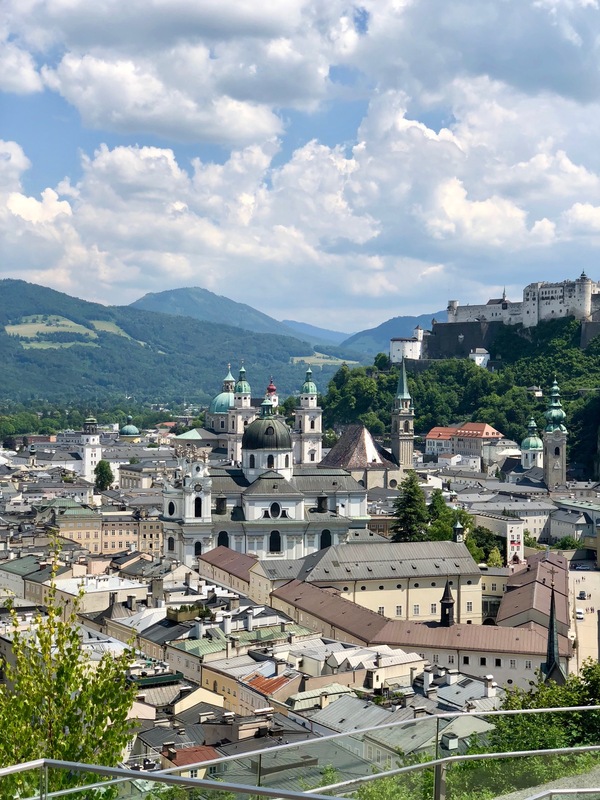 The desk staff was friendly and competent, and the concierge made our first few hours in Salzburg a pleasure with his helpful suggestions for lunch and strolling. Here too there is renovation going on, and the entire Danube-side façade of the place was unfortunately covered with tarps. It would be worth knowing then this work will be finished. Mandarin Munich – As enjoyable as I remembered from business trips in the past, and though I was initially disappointed that the previous French restaurant was gone and dismayed by the noise level and overly casual ambience of Nobu’s new place, we had an excellent Japanese meal there and made good friends among the well-trained, efficient staff. The hotel staff in general was a delight. Our penthouse suite (Room 704) was the most spectacular of our trip, built into the turret of the hotel with a domed glass ceiling in the living room and striking views in all directions over the city. The only downside is that it is on a well-traveled hallway used by guest and outsider alike to reach the rooftop Terrace Bar, but we were well-insulated enough that it didn’t matter. Dining in Munich: The sushi in the aforementioned Matsuhisa’s is absolutely world-class, as you’d expect of this celebrity chef. Memorable in a different way was Konigshof Gourmet Restaurant, which is on many an international foodie list. Nice bar, and on the restaurant level quite impressive, but sepulchral is the only word for the ambiance; we could have been in the greeting room of a mortuary. Diners speak in hushed tones over their ox cheeks and venison, nary a utensil clinks unnecessarily, sommelier and captain were friendly but stiff. The food, which is the point, is good, but in a self-consciously gourmet-forgettable way. Three hours later, exhausted by all the serenity, we Ubered home and directly to bed. The good news is that restaurant and the hotel in which it sits are getting a three-year renovation starting late 2018, so perhaps a new spirit can be found. And finally, near the Marianplatz in a beautiful ivy-clad house is Pfistermuhle, which serves tasty farm-to-table local fare with in a casually modern ambience, and is worth a stop. Keith McWalter is an author and lawyer. His essays and commentary have appeared in the New York Times, the San Francisco Chronicle, and the Wall Street Journal. He lives with his wife Courtney in Granville, Ohio and Sanibel, Florida.